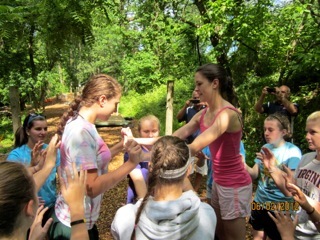 At Terrapin Adventures, we have a low ropes course element called Wild Woozy. Two participants face each other while balancing on a triangle shaped cable using each other for support. The goal of this team building exercise is to travel from the apex to the base using each other for support. Their team- mates spot them as they travel down the cable. We like to call this exercise “Total Commitment” because without it, the two participants will not get far. The natural tendency is to pull back from each other as each person struggles to stay balanced. It is hard to lean on someone else, particularly if you do not know them well. Many participants are tentative and are unwilling to commit. However, if both participants communicate & push against each other and provide support, they can travel quite far down the triangle. We have people who buy into this exercise so deep that they can almost be flat out horizontal supporting each other, an amazing transformation from a tentative beginning. Likewise in group projects, people need to commit to each other to succeed. Clear roles must defined. Regular communication is critical to have clear expectations, smooth handoffs, and the always-important adjustments during a project. More can be achieved when each person commits their talents to the project and trusts the other team members to complete their roles. Laying out a project’s goals, milestones, and critical tasks to all team members allows everyone to see how their role fits and they can offer support to others at critical junctures. Terrapin Adventures is conveniently located in Howard County, Maryland, between Baltimore and Washington DC. Our custom onsite and offsite team building solutions are presented in a fun and creative way that will help break down barriers, foster communication, and teamwork, and help stretch the limits of your team. This entry was posted on Tuesday, November 12th, 2013 at 4:16 pm. Both comments and pings are currently closed.